Seo an sguad airson a’ gheam an aghaidh Bhoth Fhleasgainn air Disathairne 2a den Mhàrt. Tha an geam a’ tòiseachadh aig uair feasgar aig Pàirc Mhic a’ Ghobhainn, Inbhir Arnaidh faisg air Inbhir Nis. Here is the squad for the Away game at Boleskine on Saturday 2nd March. The game throws-up at 1pm at Smith park, Inverarnie by Inverness. P. Duke (Sgiobair/Captain), F. Binns, W. Church, S. Charity, D. Gallagher, P. Gomez, K. Kennedy, D. Lamont, I. Lamont, C. MacDonald, A. MacKenzie, MJ MacLeod, S Murray, D. Shaw, IP Sinclair, C. Stamper, E. Stewart. YOUTH TRAINING AS NORMAL THIS SATURDAY 10 TO 12 at STORNOWAY PRIMARY WITH BOYD AND JOHN. Camanachd Leòdhais are delighted to announce the commencement of Youth Coaching on Saturdays at Stornoway Primary between 10am and 12noon. Training will be suitable for children from Primary 4 to Secondary 4. Players should bring boots and shinguard but helmets and sticks will provided if you don’t have them. There will be a warm welcome for all those pupils who play at the Nicolson Institute and Stornoway Primary already as well as any pupils of other schools, Shawbost, Lional, Back, Sir E Scott, Laxdale who have experience of shinty. The club is also delighted to welcome back Boyd Mackenzie in a youth coaching capacity. Boyd was instrumental in developing several of the players who now make up the first team squad and in maintaining shinty in Lewis until he took a well-earned sabbatical from the sport. He will be assisted by John Nally and any first team players who may be available. The club will be arranging fixtures for the youths and hopefully seeing these players form the back bone of the squad in a few years time. Training will run through the season, so even when there are Senior Away Games training will be on. Please check the twitter feed @lewiscamanachd for any updates. An entertaining game on Saturday at Shawbost. We gave a good account of ourselves against a good side from the league above and we also enjoyed having our friends from Skye over as always. Will and Duncan scored our two goals and managed to make it 3-2 at one point when we were pushing hard in the second half. Fair play to Skye for some cracking goals and best of luck to them in their season. Squad for Skye Challenge Match Shawbost 16/2 Throw-up 2pm. Please note throw-up at 2pm, Sgoil Shiaboist, Shawbost. All Players to meet at South Beach Car Park at 12 noon. A 18-0 thrashing by Skye in the Strathdearn Cup in 2010 was a catalyst for Camanachd Leodhais seeking league entry as the club committee were of the opinion that only regular competition would improve the club to a level that would hopefully stop such events happening again. The two clubs met for the first time in a full match in Lewis in January 2012 and the score was Skye 10, Lewis 2. 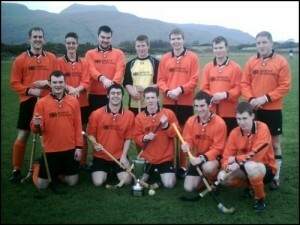 Previously, Skye sent two teams to the inaugural Craig Morrison Sixes in 2010 and their A team won the event. this came a few months after the heavy defeat in Portree so it was a matter of pride that the Lewis A squad almost defeated Skye A in this competition, with only a last minute goal saving Skye’s blushes in a 1-1 draw. Before this Skye had competed in the 1987 Mod Cup against Beauly in Stornoway which was the last senior game played in Lewis and Harris before 2011. Reading the Skye club’s history, “Skye Camanachd: A Century Remembered” by Martin MacDonald, it is interesting to note the simliarities between the Skye club’s early years in the 1890s and 1900s and those face by Lewis Camanachd in the 2000s. 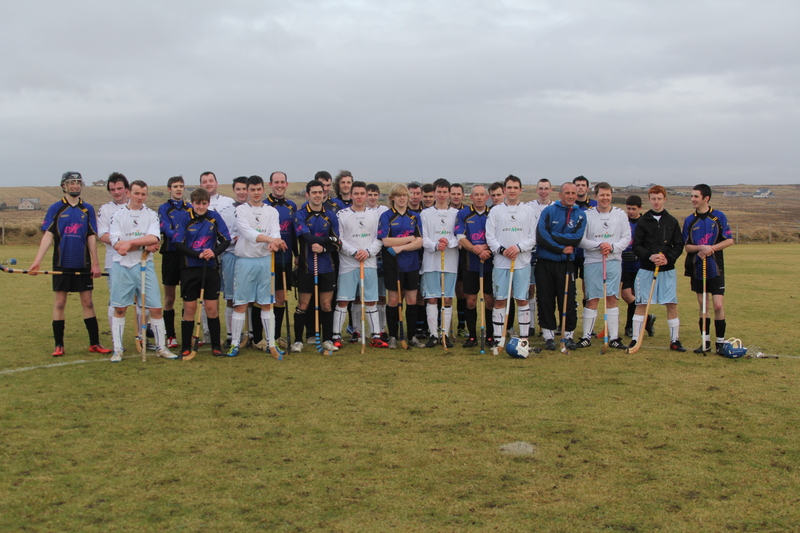 The two clubs share a common bond in our identity as Hebridean clubs, the inherent opportunities and challenges that this brings shinty clubs on the periphery,the family and friend links between players and supporters and through both clubs providing the bulk of the Alba representative club due to our shared commitment to the Gaelic language. We look forward to welcoming our Sgitheanaich brothers for this year’s match. Suas le Eilean an Fhraoich agus Eilean a’ Cheo! Congratulations to Lochbroom on winning the Cuach a’ Chuain Sgìth on Saturday. For the first time in the history of the fixtu the match went to extra time. Lewis went ahead through Paul Duke and Will Church and looked ready to push on. Then a speculative Sandy Urquhart effort sneaked over the line and then a Neil Fraser effort levelled the scores before half time. There was no score in the second half and so extra-time beckoned. Again the play was scoreless until in the final seconds of the second period Euan MacFadyen got the ball past Conor MacDonald. Despite the gut wrenching nature of the defeat, we can take a lot of positives, we were never behind in the 90 minutes, we played with skill and dignity and the fitness was excellent. Next up is Skye Camanachd this Saturday at Shawbost. Thursday 7-8 at Ionad Spòrs Leòdhais. 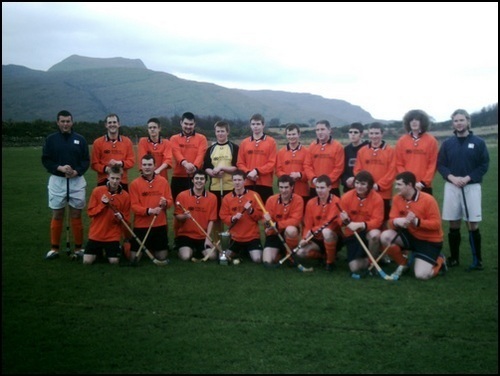 The Camanachd Association have released the fixtures for the 2013 season and they can be found at the above link. These are subject to change as the season goes on. 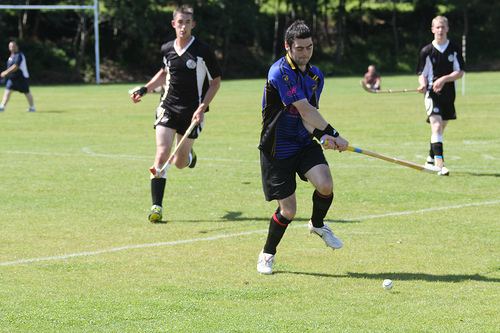 Paul Duke has been named Camanachd Leòdhais club captain for the 2013 season ahead of the Cuach a’ Chuain Sgìth fixture. Paul brings a lot of experience as a former manager of the club, with time served at Newtonmore and Kincraig and has been a stalwart Lewis Camanachd player for many years. He was player of the year for 2011. The Lewis based players should meet at the Ferry Terminal in Stornoway at 6.30am. Mainland players should be at the park at 12 noon. W. Church, P. Duke, D. Gallagher, D. Lamont, I. Lamont, C. MacDonald, AM MacDonald, D MacIntyre, A MacKenzie, M MacLeod, S MacLeod, S Murray, A Reed, D Shaw, C Stamper, E Stewart. Throwup 1pm at Inverlael by Ullapool Saturday 9th February. Bidh Camanachd Leòdhais a’ cluich a’ chiad gheam den bhliadhna Disathairne 9mh den Ghearran an aghaidh Loch Bhraoin aig Inbhir Lathail faisg air Ulapul. Bidh an geam a’ tòiseachadh aig 1f. Camanachd Leòdhais play the first game of the year, the Minch Cup V Lochbroom, this Saturday 9th February at Inverlael, Ullapool. The game starts at 1pm. The Cuach a’ Chuain Sgìth has played an important role in the history of Camanachd Leòdhais. 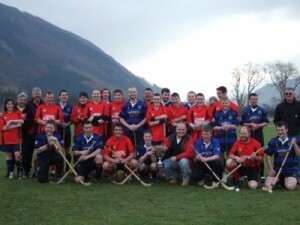 The newly re-constituted Camanachd Leòdhais put forward the cup for competition between Lewis and the then recently reformed Lochbroom who had entered the leagues in 2005. 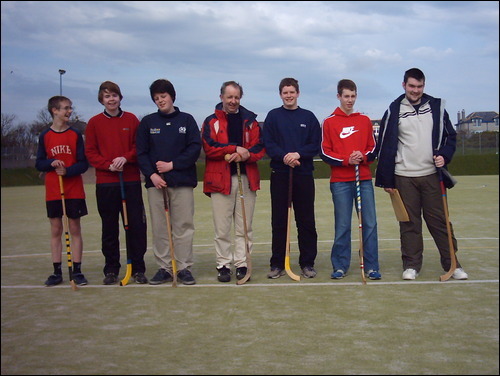 The first match, played at Morefield, Ullapool was the first ever game played by a senior team from the Isle of Lewis. Broom won that game 7-0, although it was only 1-0 at halftime. It was Lewis’ first taste of real shinty action and was the catalyst for the many adventures that the club has had since foundation. The voyage back was considered to be the quintessential return trip and even if you’re not playing it’s worth it for a day trip! The cup has been played for ever since, with a break in 2010 due to bad weather and difficulty arranging another date, and in 2012 due to its proximity to the league fixture. However, the clubs have met 4 times in league competition since 2011 as well and it was indeed appropriate that Lochbroom were the first ever team to make the trip to play Lewis on home soil in May 2011. Camanachd Leòdhais have a great debt to Lochbroom for the use of Inverlael for our cup fixtures between 2007 and 2010 and we look forward to renewing both our friendship and our rivalry this Saturday. 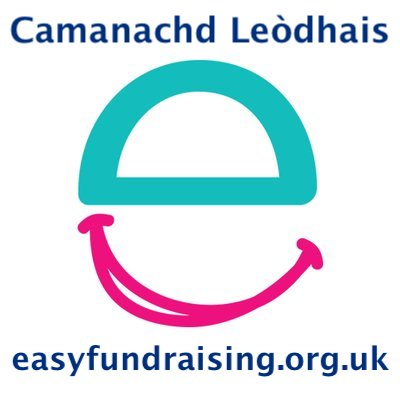 There will be updates on twitter @lewiscamanachd. 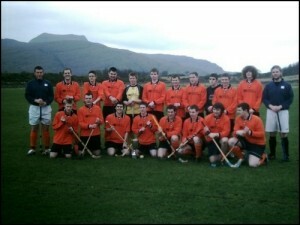 A group photo from the 2009 match which Broom won 5-0. Lochbroom and Lewis have developed as friendly rivals, Lochbroom maintaining the upper hand since 2007. To mark the start of the 2013 season, the club has moved to the twittersphere to augment our successful facebook page and of course this fabulous website. 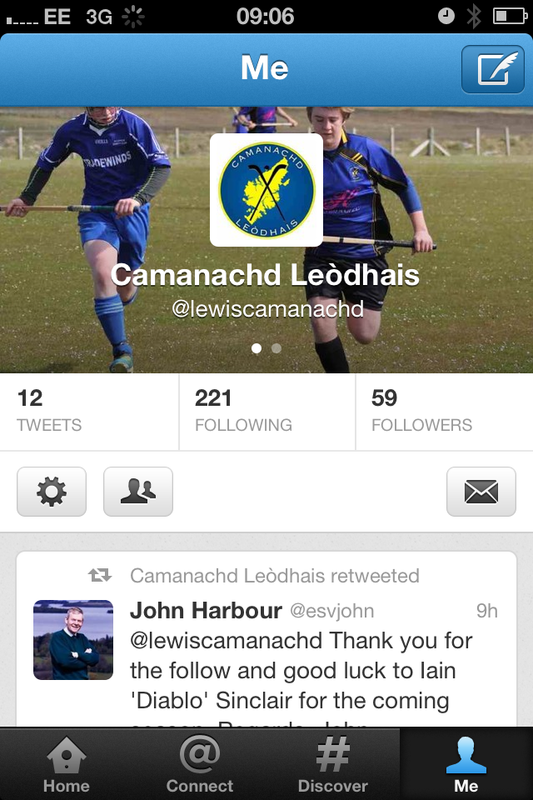 Follow us @lewiscamanachd.